Ready for your next grand off-roading adventure but not sure what to take it in? Normandin Chrysler Jeep Dodge is here to help! 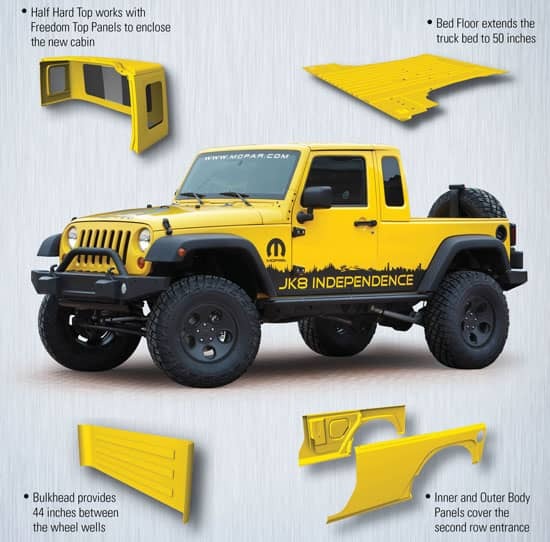 For years Jeep fans have been loving the Jeep Wrangler JK-8 Pickup Conversion Kit to transform their Jeep Wranglers. But now a new truck is in town that is going to flip the Jeep world upside down. The 2020 Jeep Gladiator is a great contender to the Jeep Wrangler with JK-8 Pickup Conversion Kit. Let’s compare some of their features to see which is a better fit for you! The 2020 Jeep Gladiator was designed to mimic the cabin of the Jeep Wrangler. The dashboards are basically identical, both containing a Best-In-Class color touch screen display that is compatible with Android Auto and Apple CarPlay. While the interiors of the Jeep Wrangler and 2020 Jeep Gladiator are very similar, the Gladiator has stepped it up with some improved features. The Gladiator has Best-In-Class passenger space, easily seating 5 people comfortably. The Jeep Wrangler only seats 2 passengers. The Gladiator back row seats fold down to reveal a cargo lock box to store your precious belongings with you are out of the vehicle. The seats also fold up to addition cargo lock boxes. Our favorite feature if a screws box located behind the back row of seats where you can easily put your screws when having the top off. The screw box even labels which hardware goes to that part. While the 2020 Jeep Gladiator and Jeep Wrangler with JK-8 Pickup Conversion Kit look similar, it is a process to get that way. To convert the a four-door Jeep Wrangler Unlimited to a two-door pickup truck, two processes are involved in the conversion from: disassembly and reassembly. This can be a lengthy and expensive process. If you are wanting a pickup truck that still has the power and outdoor ruggedness that Jeep always provides, the 2020 Jeep Gladiator is the less expensive and more time efficient option. Although Jeep has not released an official price for the 2020 Jeep Gladiator, experts are speculating that it will have a starting price of $31,445, just a smidge higher than the 2019 Jeep Wranglers $28,045 price. With the added price of the JK-8 Pickup Conversion Kit at $5,499 plus labor, it is easy to see that the 2020 Jeep Gladiator is the better deal. Ready to come check out the 2020 Jeep Gladiator in person? 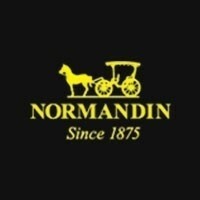 Normandin Chrysler Jeep Dodge is standing by to give you the best car buying experience. We love serving the people of San Jose, Sunnyvale, Santa Clara, Milpitas, and Fremont. We cannot wait to see the smile on our face when we find the car or truck of your dreams! 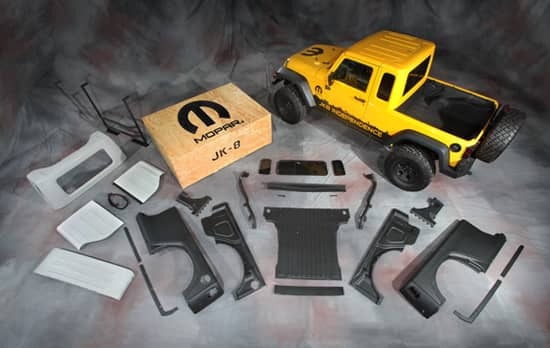 Jeep fans have been loving Mopar’s JK-8 Wrangler pickup conversion kit. The kit, which generated considerable buzz among Jeep enthusiasts, enables a Wrangler Unlimited to be converted into a 2-door model with a pickup bed. The design incorporates cues from the popular 1980’s Jeep Scrambler CJ-8. Major components include a spacious 44-inch by 50-inch steel bed, inner and outer bedsides constructed from stamped sheet metal, Freedom Panel assemblies, a removable fiberglass hardtop with a sliding rear window, two fixed side windows, and a fiberglass bulkhead. A special JK-8 badge is also provided for the left rear quarter panel. The part number is 77070049. MSRP is $5,499, not including installation. It comes with a 3-year/36,000-mile warranty that covers kit materials and workmanship performed only at Normandin Chrysler Jeep Dodge’s factory authorized body shop. The kit is built to order, and customers should allow 30 days from the order date for it to arrive. Mopar recommends that a dealer body shop perform the installation, as normal body repair techniques are required for this conversion. The Hardtop and Freedom Panels are smooth, ready to accept a chosen color. Once the conversion has been done, it’s permanent. Installation time, including painting, is estimated at 12-16 hours. Two processes are involved in the conversion from a four-door Jeep Wrangler Unlimited to a two-door pickup truck: disassembly and reassembly. In disassembly, each rear door is removed. Next, the rear-bumper assembly, hard top and Freedom Panels are removed, followed by the rear portion of the interior, which includes seats and carpeting. Exterior trim parts are removed and preserved; inner and outer body panels are removed by drilling out the spot welds, which allows the panels to fall away and avoids having to cut into the sheet metal. The rear sport bar is cut away and removed along with B-pillars. Reassembly into a two-door pickup truck begins with installation of the B-pillars, cross member, floor-pan assembly (truck bed), and the inner and outer quarter panels (welding is involved in assembly). Next to be installed is the bulkhead reinforcement assembly and sport bar extensions, and finally the installation of the fiberglass bulkhead itself. The kit, with components delivered e-coated, is then prepped for paint. Windows are installed to the hard top, which is then installed on the vehicle. Exterior trim parts are then reinstalled. Jeep fans rejoice- the new 2020 Jeep Gladiator has been revealed! The midsize truck is back and better than ever. With best-in-class towing of 7,650 lbs. and best-in-class payload of 1,600 lbs., there isn’t any adventure this Jeep couldn’t take on. The 33-inch all terrain tires and Dana 44 front and rear axles, with the 4×4 system, are designed for off-roading. Who ever said you can’t have your cake and eat it too hadn’t been in the 2020 Jeep Gladiator. Finally a truck that combines ruggedness and luxury exists. Leather trimmed seats and largest-in-class 8.4 touch screen with Uconnect 4C Nav are just a couple of the features in the all new cabin. 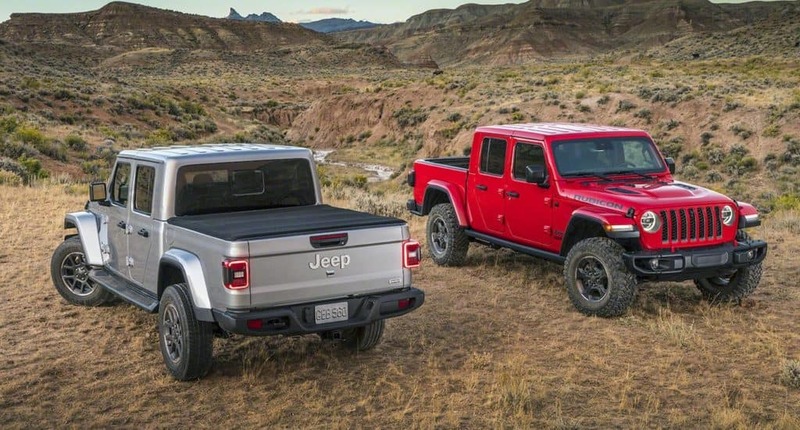 The 2020 Jeep Gladiator will be arriving soon!